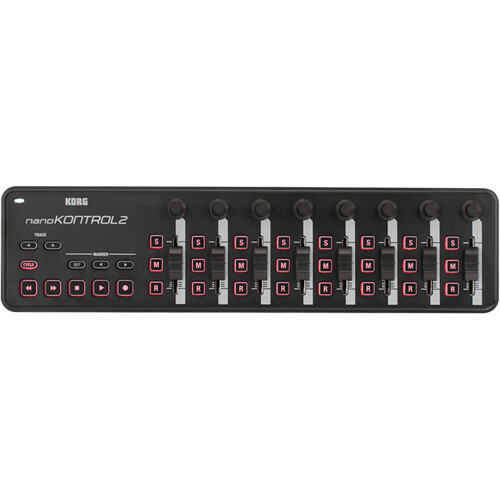 The nanoKONTROL2 from Korg is an ultra-compact and low-profile controller that provides eight channels of control for numerous software titles, including major DAW programs. It fits perfectly in front of a laptop or desktop computer keyboard, and using a single USB cable offers impressive control while conserving valuable set-up space. A knob, fader and three switches are provided for each of the eight channels, initially assigned to pan, volume, and solo, mute, record. The various controllers can be reassigned for use with a virtual synthesizer for instance, to change things like envelopes or filters. A dedicated transport control section is also included. The controller is USB bus powered, and with the appropriate connector kit (not included), the unit is compatible with Apple's iPad. Downloadable software allows for custom configuring the faders and knobs, and licenses are provided for 3 virtual instruments to facilitate immediate music creation. Box Dimensions (LxWxH) 14.75 x 3.95 x 1.45"
nanoKONTROL2 - Slim-Line USB MIDI Controller (Black) is rated 4.6 out of 5 by 27. Rated 5 out of 5 by Emmanuel from Bang for the buck At this price point, korg is literally giving out a gift. Overall, the build quatlity of this unit is really good. I have had the older version for years now, and it works flawlessly. I use this product for controlling protools. It really saves time being able to stay away from using the mouse to play, pause, loop, adjust levels, pan tracks...etc. The 8 faders control track 1-8, you can then use the 'next' buttom to dedicate those eight faders to track 9-16. It is my understanding that multiple units can be used simultaneously. If so, the I will seriously consider purchasing 3 of these to give me 24 tracks of direct control. Rated 5 out of 5 by Anonymous from Mini mixer, small and light nanoKONTROL2. I love it. I use it extensively with the iMS20 application to control volume and pan of up to 8 channels. You can also pick any channel out of the 8 to hear it solo, mute it, or record over. ITS LIKE A LITTLE MIXER :))) I hope Korg can make the volume knobs a bit heavier to give it a more realistic feel. Physically, the unit is solid and made of clean plastic and has a decent weight to it so it doesnt feel like a toy. There are quite a few keys on the right side for controlling your DAW software or music app (rewind, stop, play, record, cycle, skip tracks, and markers). All functions and keys are editable using the Korg editor software. Rated 5 out of 5 by JuiceDAY from Very NICE I use this for Ableton Live, it's miles away from the old nanokontrol... it will receive midi signals, so when you click something with your mouse in a DAW the corresponding button is illuminated or turns off on your nano. Comes ready with mappings for some DAWs (ableton and others) or you can make your own maps. WIth the preloaded ableton map you can solo, mute, rec, pan, fade, and you can cycle between which tracks you control... control first 8 tracks then hit next track button and control the next 8. No motorized faders but you cant expect that. and the buttons dont stick anymore. Rated 4 out of 5 by Dave G. from Great for the money spent Pretty much what I expected.? I downgraded to 4 stars because I didn't know the buttons would not light up in some programs, I assume they do in the Korg supplied downloads. It hasn't been an issue. I use this in Mixcraft 7 for live playing and I can control channel sliders and triggering of mute button etc by mapping my setups. I could well have bought a more expensive controller that would execute learning the setups with Midi Learn capability. I wasn't concerned about that right now. So it works quite well for me and does what I expected it to do minus lit buttons. The drivers in Windows 10 downloaded automatically, in my other computer with 7, I had to go to the web site and download that driver. But everything works fine with no big surprises. Rated 5 out of 5 by Clifton C from It DOES work with Magix Samplitude Pro X It does work with Magix Samplitude Pro X as long as you have version 12.4 or later. All you have to do to get it to work is to set the control to MIDI in the Korg Control Editor, then open Samplitude (starting with ONLY 8 tracks to begin), next (if you have a Windows system) press Y to open up the System Options window. On your left hand side of that window should be Hardware Controller. Click that. Now click Add New, scroll down to Factory Presets and there should be a Korg nanoKontrol template already mapped out for you. You can Re-Map these if you'd like with the MIDI Learn functions in Samplitude (Video on YouTube by kraznet explaining how to do so). Works great after setup! Thanks BHPV for the quick shipping also! Good luck guys! Rated 4 out of 5 by zoologies from Needs a software update This product works pretty much as advertised and is good for the price. The construction is plastic all over and the sliders do their job but are not pro quality. The main problem is that Korg haven't updated the editor software for version 2, so trying to edit the controls with the supplied editor doesn't work. Rated 4 out of 5 by Alexei from I'm satisfied with Korg nanoKONTROL2 I bought a black Korg nanoKONTROL2. It fits perfectly in every different set. Mapping and controlling parameters on Mainstage 3 are easy and I was able to do that at a glance.? The faders and knobs are smooth. The buttons, faders, and knobs are small, but after working a while, you become familiar with their size. There is no buttons backlight, which makes hard to figure out if the parameter controlled by that specific button is on or off. You have to check on Mainstage 3 Perform view to check the parameter status. While playing alive, it is hard to find which specific controller I have to press or to slide. The contrast between buttons, faders, and knobs with the background is low, for all have the same color. The low contrast requires me extra energy and attention during live performances. Could this be configured to control software such as lightroom or premiere pro? This is feedback from users of this product.As long as you do not install the Korg MIDI USB drivers, it has the potential to be mapped to different DAWs. However with that being said, Korg as a manufacturer does not guarantee this controller to work with anything that does not support their drivers. when this controller is used to control more than 9 channels..we need to go to the next bank of faders and after returning to first bank (1-9) previous values of software mixer faders jumped to the new settings when we try to move sliders of nano kontrol? Because the faders are not automated, they will remain in the same physical position when you jump from one bank to another. However the levels on each bank will not change when you shift banks. The levels on the next set of banks will ONLY begin to change if you begin touching the faders. Works with fl studio 12 or 20? Do the dials have detents/clicks? I would like a controller that has about 10 clicks per full turn. No clicks, it's a smooth 270ish degrees.